ALFIDAA Engineering presents the fit solutions for difficulties faces the factories and the industrial facilities by the professional team of engineers and the authorized international brands. ALFIDAA Engineering maintains, develops and improves the performance of old control and automation systems, in addition to design and implement new, modern, efficient and high quality control and automation systems. 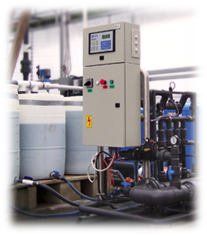 - Irrigation control systems: ALFIDAA Engineering produces many irrigation control systems in Jordan and other countries to control irrigation pumps periodically according to specific time and quantities. - Textile and Carpets Machines control systems: ALFIDAA Engineering designs and implements high efficient and quality control systems for textile and carpets machines to control the motion and drawings with easy and reliable interface. - Refrigeration Rooms Control systems: ALFIDAA Engineering presents control and monitoring systems for temperature, humidity and pressure of the storage and refrigeration rooms.